Jimmy Nguyen spoke about blockchain technology at the 2017 Digital Entertainment World expo. He was the moderator for the session entitled “Making Blockchain Pay: Remittances, Micro-Payments and Cryptocurrencies” – discussing how blockchain payment methods can transform digital entertainment. 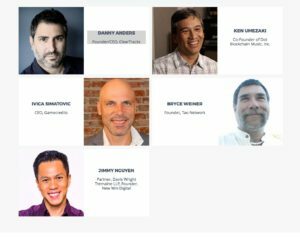 His panelists were Danny Anders, Founder/CEO of ClearTracks; Ken Umezaki, Co-Founder of Dot Blockchain Music; Ivica Simatovic, CEO of GameCredits; and Bryce Weiner, Founder of Tao Networks.